Record Request Information: To expedite the request, be as specific as possible in describing the records being requested, including dates. Also, please include the type of access requested (copying or inspection) and the medium requested. I agree to pay the actual cost of duplicating, scanning, and/or mailing copies of the requested public records. I understand that the City is prohibited from disclosing lists of individuals to requestors for commercial purposes and do hereby swear under penalty of law that I will not use or allow others to use such public records for commercial purposes. Click here to electronically sign this form. 2.50.070 Costs of providing copies of public records. (A) No fee will be charged for the inspection of public records or locating public records and making them available for copying, except as described in RCW 52.56.120(3). e) The actual cost of any digital storage media or device provided by the City, the actual cost of any container or envelope used to mail the copies to the requestor, and the actual postage or delivery charge. (C) The charges in Subsection (2) of this section may be combined to the extent that more than one type of charge applies to copies produced in response to a particular request. (D) The City may charge a flat fee of up to two dollars for any request as an alternative to fees authorized under (2) this section when the City reasonably estimates and documents that the costs allowed under this subsection are clearly equal to or more than two dollars. An additional flat fee shall not be charged for any installment after the first installment of a request produced in installments. If the City has elected to charge the flat fee in this subsection for an initial installment, it may not charge the fees authorized in Section 2 on subsequent installments. 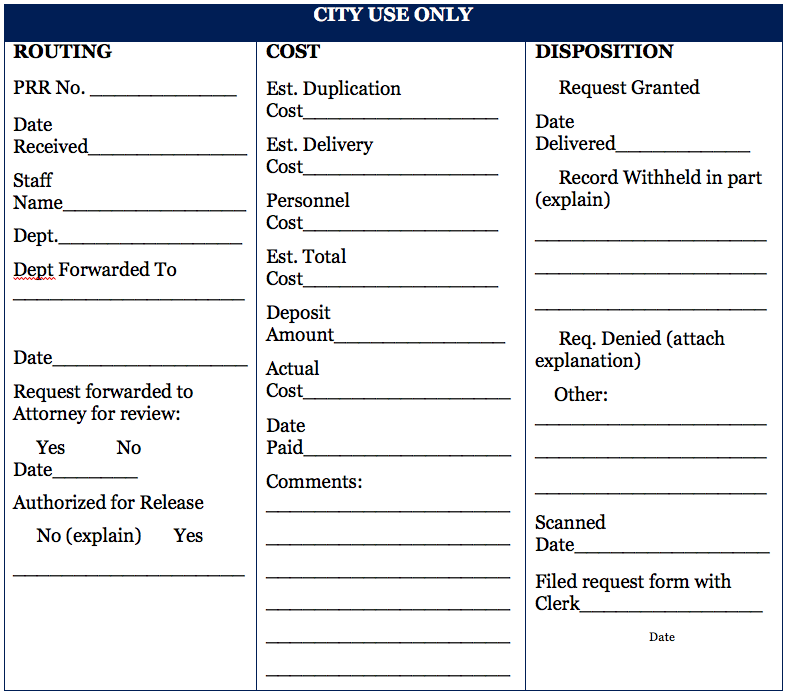 (E) The City shall not impose copying charges under this section for access to or downloading of records that the City routinely posts on its Website prior to receipt of a request, unless the requestor has specifically requested that the City provide copies of such records through other means. (F) A requestor may ask the City to provide, and if requested, the City shall provide, a summary of the applicable charge before any copies are made and the requestor may revise the request to reduce the number of copies to be made and reduce the applicable charges. (G) The City may include a customized service charge, as allowed by RCW 42.56.120(3). (H) The City may require a deposit in an amount not to exceed ten percent of the estimated cost of providing copies for a request. If the City makes a request available on a partial or installment basis, the City may charge for each part of the request as it is provided. If an installment of a records request is not claimed or reviewed, the City is not obligated to fulfill the balance of the request. The City may waive any charge assessed for a request pursuant to City rules and regulations. The City may enter into any contract, memorandum of understanding or other agreement with a requestor that provides an alternative fee arrangement to the charges authorized in this section, or in response to a voluminous or frequently occurring request. (H) The PRO will not charge sales tax when it makes copies or scans of public records but if the records are sent to a third party for copying/scanning, that third party may charge sales tax and the requestor will be responsible for payment of that tax as well as the third party's actual charges for copies or scans. (I) Payment. Payment may be made by cash, check, or money order made payable to the City. (J) Other copying charges. The Act generally governs copying charges for public records, but several specific statutes govern charges for particular kinds of records. The following non-exhaustive list provides some examples: RCW 46.52.085 (charges for traffic accident reports); RCW 10.97.100 (copies of criminal histories) and RCW 70.58.107 (charges for birth certificates). The City will charge the amount authorized pursuant to these other statutes rather than as provided under the Act. We will review your information and contact you soon.